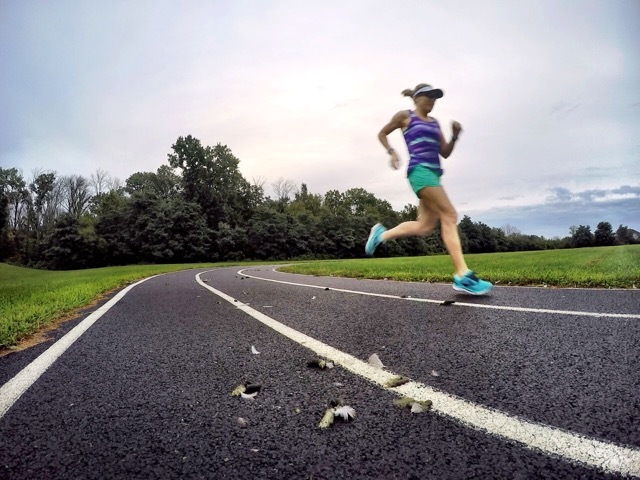 This week marked the third week of my Run Less Run Faster (affiliate link) training cycle for my OBX Half Marathon, my focus race out of my seven remaining races for the year. My training week started on Sunday afternoon with a nice little 30-mile bike ride with my favorite training partner. We headed west on the W&OD Trail since the sun was out and that portion of the trail is more shaded. I’d gotten a sunburn on a small section of my left thigh where I’d missed applying sunscreen during our ride the weekend before so I decided to play it safe and stay in the shade as much as possible. 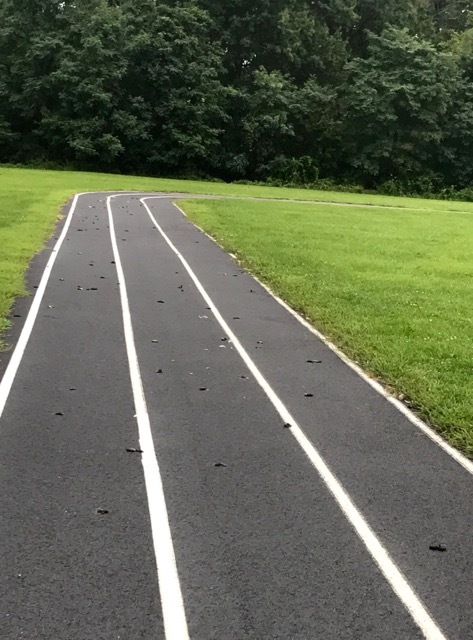 Tuesday’s morning track intervals called for a 1-mile warm-up and 1-mile cool-down bookending 6 x 800 meters with 90-second recoveries, but I misread my plan and did easy 400’s between each interval. My goal pace for each 800 interval was 7:27, but the mess the geese had left for us slowed us down a bit as we dodged goose poop. I was slow on every repeat (8:07, 8:01, 8:45, 7:48, 7:34, and 7:42), but can hardly blame the messy track. I felt slow and sluggish, and my times reflect exactly how I felt. My tempo run was scheduled for Thursday morning, but since I had clients back to back all morning starting at 6:30 AM, it was impossible for me to meet my running friends on the trail at 5:30 like normal. Since I needed to pick up my SUV from its oil change on Wednesday afternoon, it seemed like a great idea to run and pick it up. It’s exactly 6 miles from my house to the dealership if I stay on the running trails so I decided to follow my training plan and run there, a day early. My plan called for a 6-miles total with a 2 mile easy warm-up, 3 miles at tempo pace (8:13), and a 1 mile easy cool-down. I felt pretty good when I finished, but once home I started getting nauseous and felt miserable until the following morning. Too late, I determined that I was extremely dehydrated and probably had an electrolyte imbalance. The next morning I took a Gatorade to the gym to sip and by the time I finished it, I was starting to feel normal again. 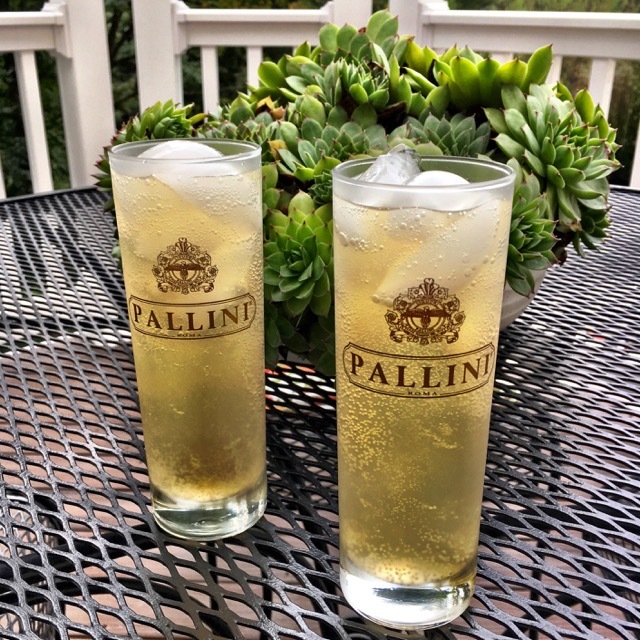 Bill and I celebrated Friday evening’s arrival with one of my favorite drink concoctions – beach peaches, a mixture of peach Pallini, coconut rum, and sparkling peach Izze. They are so refreshing and the perfect beach drink! Saturday’s run called for 10 easy miles, of which I ran 9.75 miles solo. I averaged a 10:35 pace and felt great except for losing about 10 pounds of sweat. The temperature was only 75° when I finished, but the humidity was 97%. To say I was soaked to the bone would be an understatement! 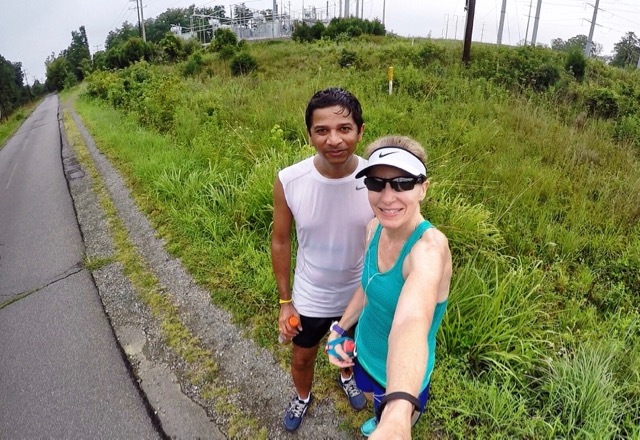 And then right at my 5-mile turnaround point, I saw Amit and Ramesh and ran a quarter of a mile with them until I stopped to fuel. It’s always great seeing Cruiser friends out on the trail and I need to be better at organizing runs with them like in the past. The best part of my run was seeing my Cruiser friend Joe’s dog Lincoln in their back yard about a mile from my house as I ran home. I stopped long enough for some puppy kisses and then continued on for my final mile. Looking ahead to this coming week on the blog, I’m hoping for a fun and somewhat silly little post on Thursday, but the topic is a surprise – stay tuned! Also, coming up during the fall racing season, I plan to finish up my throwback race recaps from races of yesteryear. I’ve got nine on tap. What’s the worse thing you’ve stepped in while running or walking? Do you have a dog? If so, what kind? I think Goldendoodles and Westies are the cutest! Congrats on a very strong week of training! The humidity can make the runs feel so difficult – good job on powering through! 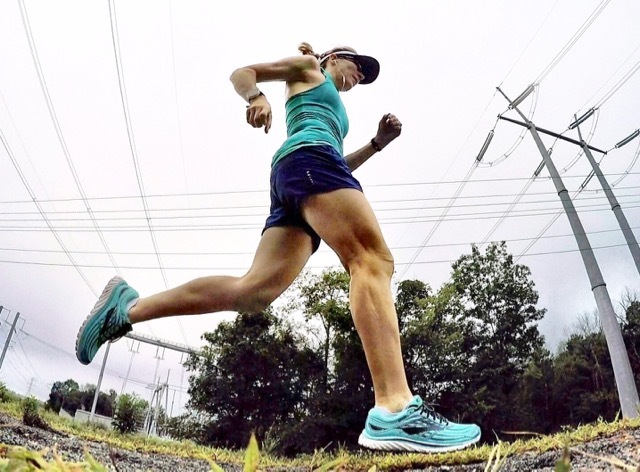 Cyndi recently posted…Electrolytes: What are they and how do I replace them? Congrats on your first trail half! I love trail running, but don’t do as much of it as I’d like. No dogs over here! I love how much you are into biking these days we have to meet up for a ride sometime in September. That sounds great! I’ve got a crazy (crazy good) next few weeks and hope things will calm down in mid-September. Great job this week! Usually I try to run later in the evening and when I did a run right after work, I was feeling that temp difference as well! I give you credit for running on that track! That would have been such a distraction for me! Thanks, Sara! You get bonus points for running in the heat of the evening. At least it’s cooled off a little by the early morning. You have probably seen a pic (or several) of our Max…he’s a Lhasa Apso-Shih Tzu mix 😉 I don’t think I’ve ever stepped in animal poo, but I’ve had my share of mud that was stickier than it looked and fresh cut grass that left the backs of my legs grass-speckled. Yep, I’ve seen a picture or two of Max. 😉 He’s a cutie! Looks like a great week of training! The goose poop on the track would have driven me nuts! I’ll have to go back and check out your post on interesting photo backgrounds – I’m always looking for ideas! 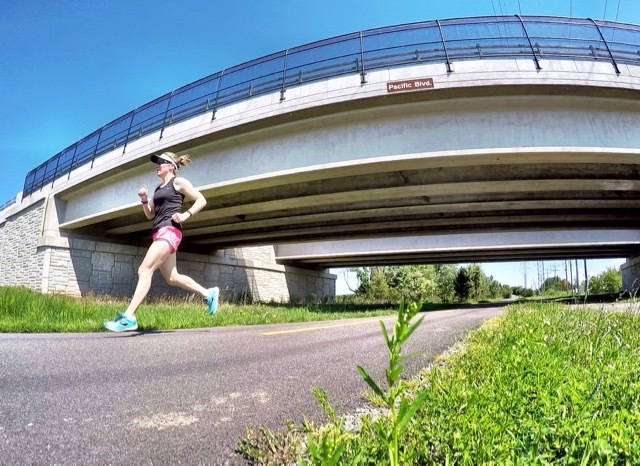 I hope you found some good running picture taking tips you can use! Puppy kisses are the best! 🙂 My dog is a collie/heeler/pit mix and she loves to run with me. It usually turns into more of an interval run though because she always has to stop and sniff! Dogs can be great running partners, until they stop to sniff. I’m sure she loves it, though! I am green with envy over your shady bike trail. Boy did I suffer in the sun today! Great job with training this week! The worse thing I’ve stepped in on a run? Vomit. I ran the Billy Bowlegs 5k in FL. It’s run late at night. There was puke in each lane of the high school track we finished on. Oh gross! I almost stepped in it at a finish line once. Thanks goodness I saw it just in time! Oh no on that poop!! Sometimes I see that on the lakefront and i have to be careful when running. 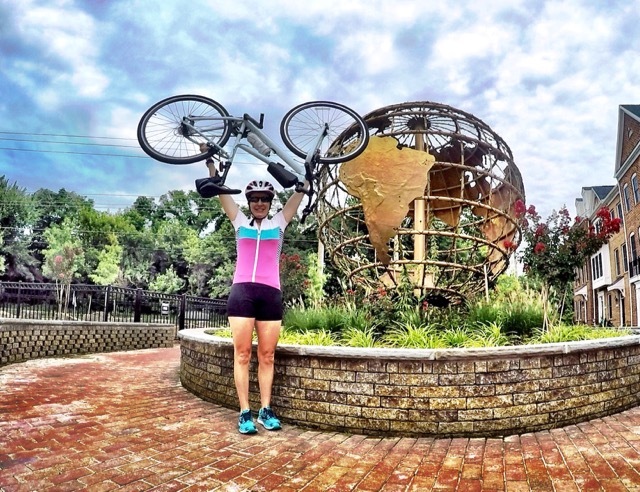 Zenaida recently posted…Burpees challenge, a peek in my room, and some running. I saw a lot of geese and goose poop when running on the Lakefront Trail while visiting Chicago in June, so I hear ya! I hear you on feeling nauseus and exhausted after that run in the sun 🙂 I have a race this coming weekend – it’s a team relay event, so by the time I do my 5k, it will be around mid-day under the scorching sun. So this past weekend, I tried to run at 11am to practice for running at that time, and nearly died! Used lots of rehydration fluids when I got back and felt better after a while. But yeah not fun! I hope your relay went well and that you had fun! 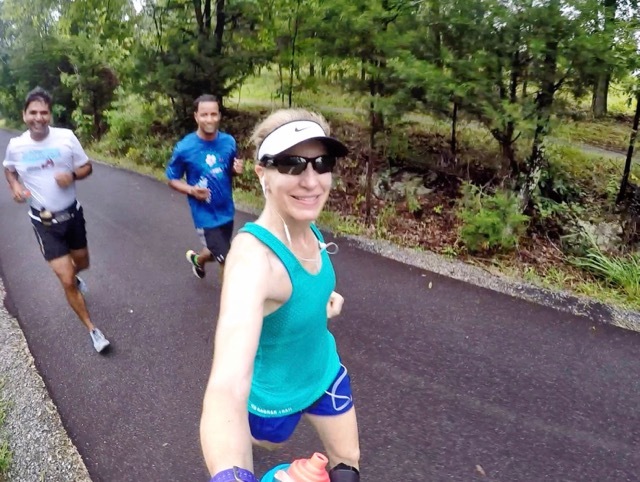 Last fall I ran Ragnar DC and since it can get very hot here in the fall and you never know what time your three runs will be, I trained mid-day all summer long. I was acclimated then, but certainly not this summer so I paid for that run. Related to “worst thing you’ve stepped in”…I have a friend who, on a night run had a bat fly at her face! She doesn’t think she got bitten. But she saw a doctor who said a baby bat could have bitten or scratched her without her knowing it. End result was a number of rabies shots for her! It’s making me rethink my night runs with my husband :-/ I’ve started using a hand held flashlight instead of a headlamp so I can hold it (& the bugs it attracts) away from my body. Wow, Daphne was quite the runner in her day! Even though I used to only run in the afternoons except for races, I tell you I’m not sure I could run in the afternoons now. BUT I do believe it is great to change things up and you’re fortunate to be able to have nice places to run. If I was to run to town it would be about 18 -22 miles. Maybe I could bike it?? 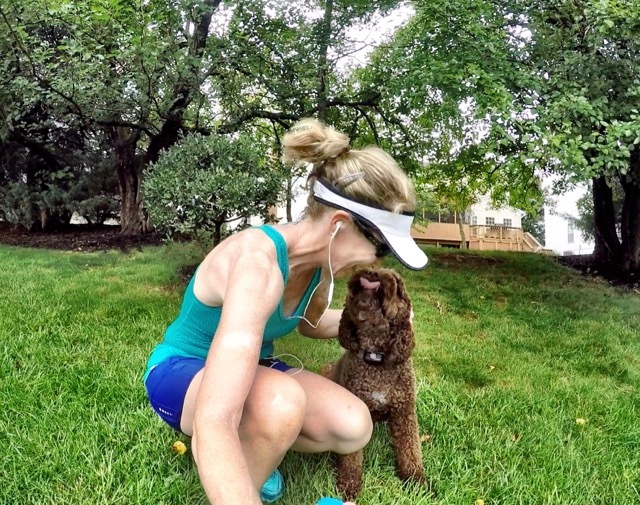 I have a Mini Austrailian Shepphard and while he will run with me a lot in the mornings, I couldn’t take him on my 6.5 miler this weekend because he just gets too hot! How fun to see so many friends on your run!